Are they good or are they crap? Location: Tuesdays is applesauce days! Okay so I saw a bunch of these sprites around here and you know people doing all the weird things to them like recolors and fusions and stuff so I decided to try it for myself. My friend takes like a computer graphics class or something and he helped me out a little bit. As far as using what tools to use and stuff. I used paint for these and they are my very first so don't laugh! I attempted to do some revamps. Last edited by pokemon_otaku on Wed Jan 02, 2008 1:13 pm, edited 1 time in total. They're real good, 9 outta... OMG! Is that FAKE FAKE TRANSPARENCY I spy? You used the right one for the 1st one, but the revamps (I think) show. Because of that, 8 outta 10. Thought no-one was gonna notice, he? What do you mean by "fake trasparency"? and "the revamps show"? 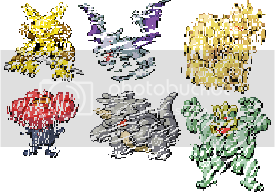 And fake transparency is when you paint the background of your sprites with the color of these forums so it just shows the actual pokemon. Revamps... Ouch! Revamps are definitely NOT just recolours!!! You need to adjust the outline and shading They need loads more work! Is that FAKE FAKE TRANSPARENCY I spy?Because of that, 8 outta 10. You can't judge people's art because they don't have transparency program(s). At least he made the effort of hiding it. Last edited by pokemon_otaku on Fri Sep 28, 2007 5:07 am, edited 1 time in total. I get kinda paranoid sometimes, so that's why. I shouldn't have said that, as in my first sprites I did a terrible job at fake transparency (at least 3 times as bad as P_O), until I found out the wonders of the 'Print Screen' button. Ps. 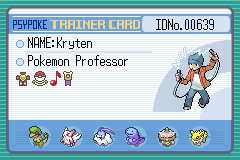 The Trainer fusions are real good, although there are 2 stray pixels on the Karate Man. 9.7/10! Wow, I like the pink gardevoir, 9.5/10. "Devotion, Determination, and Dedication is just what a leader requires." This is umm a thing I made involving some of the double battle people with 7 of the evoloutions of eevee. Really? I have gimp and it's very easy for me to make it transperent . Now what you put on the trainer and eveeloutions was defenatly fake transparency. They're pretty good but try putting old sprites with old sprites, it doesn't look weird then. Why did you stretch the sprites when you did the jittery thing? It doesn't look as good that way. Hmm I thought they looked better strechted out, and I also thought that's what you're supposed to do. Plus those were just for fun. Oh well. they r pretty good, except that if u try fake transparancy, make sure that parts that are enclosed in pokemon arms and legs are recolored 2. My image are "X" instead please enjoy this yellow "Happy Face"
I love your Pinklovers & revamp! Pretty good work so far! My favourites are (hate to say it but...) the Pink Gardevoir, the Macho Trainer Man and the Custom trainer with her revamped Wartortle. I'm not heavily attracted by the pink kingra for some reason though. Whoa, Coincedince, it was "pink day" At our school today. lol. I like the Pinkovers, really cool. never praised nor never known. Our thoughts defined the passing days. Sensed the spirit, seized the age. After all these years to dream again. Like smiling children with faces raised. Cheering their path. Tomorrow's glory days. Last edited by pokemon_otaku on Wed Jan 02, 2008 10:51 am, edited 1 time in total. I just wanted to help with your devamps. GSC sprites have little shading, so add a few more colors using the pencil. RBY sprites have more shading than them. On that Charmander, I see a lot of mecellaneous pixels (dots). Do more than just shading. Here is the guide I used: [url]dragonflycave.com/recoloring.aspx[/url]. Here are some of my sprites too (of course they aren't the best). Also look at some others (which are better). Edit: I took away the second image because those weren't so good. Last edited by TechMath on Sun Dec 23, 2007 1:55 pm, edited 1 time in total.